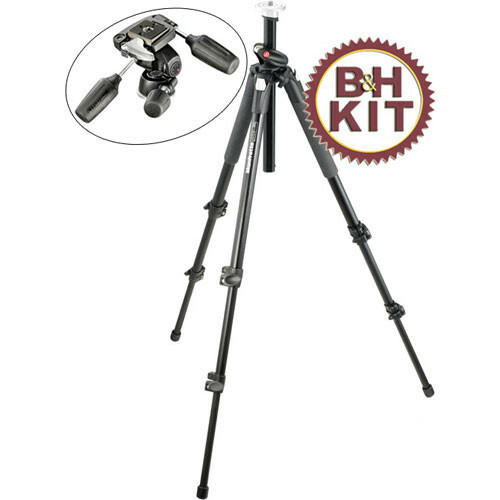 This B&H Kit pairs the Manfrotto 190XPROB Aluminum Tripod with the 804RC2 3-Way Pan/Tilt Head. The tripod has a load capacity of 8.8 lb, weighs 5.6 lb, and extends to 62.2". The rapid center column can be inverted 90°, allowing the tripod to reach a minimum height of 8.1". The tripod's three leg sections are held in place with flip locks, and each leg is individually adjustable. The 804RC2 is a 3-way head with a counter spring system to help protect your equipment. Built into the forward/back tilt axis is a fixed spring that helps to absorb the shock of the full camera weight from crashing down. The spring also makes it easier to position the camera on this axis since it opposes some of the camera weight. A quick-release plate is included with the head. The black Manfrotto 190XPROB Aluminum Tripod builds on the success of the 3001 series and replaces the 3001PRO model. Its Q90 horizontal center column feature has been redesigned to make it even easier to flip from vertical to horizontal. By extending the column to its highest vertical position, it can be swung over to horizontal like a boom without removing the head or disassembling the column itself. The ergonomics of the leg-angle release mechanism and the quick action leg locks have also been improved. While it can reach a maximum working height of 57.48" (146 cm), it can also be used as low as 3.35". The 190XPROB is ideal for use with cameras and lenses up to 11.02 lb. Box Dimensions (LxWxH) 24.0 x 4.25 x 3.85"
190XPROB Aluminum Tripod with 804RC2 3-Way Pan/Tilt Head Kit is rated 4.5 out of 5 by 11. Rated 5 out of 5 by Anonymous from Good Buy!! I bought this tripod to take hiking and to be able to use it for macro rock and flower photography. It has proved to be a stable platform in macro and 500mm telephoto work. It is not the lightest tripod, but it was the lightest and sturdiest for the price. I think $400 + for a smaller and lighter carbon fiber is just a bit too much.It is 3lbs lighter than the tripod that I was using for the same purpose. I was actually surprised at how stable it was. Everything worked fine and smooth. Even the leg locks worked fine which is better than I can say for my other tripod who's leg locks can rip off a finger. I'm 5'10 and I only have to bend down a little for the view finder unless I raise the center column which I did for stability tests. All in all a fine tripod for carrying into the high country. The head works flawlessly as well. The only complaint is that it seems to be set up for left hand operation and there is no way to switch. Rated 5 out of 5 by Ed V from Great Tripod ... Highly recommended Semi pro: photo journalism/scenery Very solid. I'm not afraid to walk away from the camera while mounted. Great quick release mount. I chose this head over the ball because I am used to this type. It is easy to level and a snap to pan. Operation is second nature. Easy set up and tear down. The unit is not the lightest, but is also not too heavy. I recommend the carrying case. It can be slung over the shoulder and the extra weight of the tripod is dispersed to the extent that it is negligible a real plus. Its only drawback is that you need to remove one of the adjusting handles for the tripod to fit nicely. I am also happy the country of origin is Italy and not China a deciding factor in my purchase. Rated 5 out of 5 by JLA from Very Sturdy At first I wanted 055XPROB for my DSLR with lens, external flash and battery pack. But when I tried it out on the B&H floor, I felt it was too big & heavy. I also looked at the 190CX4PRO but I felt that it would make my gear combination top heavy and liable to tip over. This is a perfect combination for my needs in terms of weight, size, ease of use and stability. Rated 5 out of 5 by Namwen from Great Setup This is a great deal for someone looking for a decent tripod on a budget. Its very sturdy The head is great and easy to adjust It isn't the lightest tripod, but it makes up for that with its rugged/sturdiness. Rated 1 out of 5 by Charles from Not too good. I bought this combo. hoping for a more solid and precisely adjustable tripod/head than my current $20.00 ...Velbon only to be shocked to learn it's about exactly the same on those two important qualities. When you adjust the frame then let go of the adjustment handle the camera moves and thus the framing consequently moves as well. That's the same problem I have with the Velbon from .... Geez! I figured for $ I'd get at least some improvement here. Not! I sent it back for a refund today.I can see where the individual leg movement and rotating center column would be nice features but for me the flimsiness of the setup just killed it. Guess I'll just have to keep searching. I'd have given it half a star if if that were an option. This is NOT high quality equipment. Rated 5 out of 5 by Tyler Hammer from Solid Purchase The 190XPROB with 804RC2 3-Way Pan/Tilt Head Kit from Manfrotto is fantastic! I really love how sturdy this set is. I'm not afraid to throw my Camera on the tripod, and then just carry the Tripod from location to location. Its a bit heavy but in my opinion is completely worth it. Wouldnt think twice about purchasing another. Rated 5 out of 5 by dunder from Excellent Quality. Pros: Solid, well made, careful machining of parts. Survived rough handling by shipper across country (outer box smashed and gashed - repaired with tape somewhere along the way). Inner box and kit arrive undamaged.Easily adjusts to hills, trails, wind, etc. compatible for the Nikon D7100? I have Canon 5D mark III with 70-200 Canon lens. Is it good for this package or not? This is a good kid but I actually use the fluid head with this tripod with more success. Does the center column can be used horizontally on this model? Yes, the column on that model tripod can move horizontal. Does it come with original tripod bag (Case)? Small case; you can shop for another. I have a case that I can put two tripods and my mono put in for travel.